Students interact with RMA Deputy Governor Yangchen Tshogyel after the seminar at GCBS. Students of Gedu College of Business Studies (GCBS) submitted access to finance as the biggest hindrance for people taking up entrepreneurship during a seminar on ‘Transforming Bhutan’s Economy,’ on 16 March. The need to improve access to finance topped the wish list of things students wanted improved to encourage entrepreneurship. “The Royal Monetary Authority (RMA) should do away with 30 percent equity in Priority Sector Lending since many young people are from poorer family backgrounds so that young people can take up business,” stated one of the students of GCBS. Other recommendations included, need to increase investment in human resource and export, and the introduction of international e-commerce. Both faculty members and students also felt that entrepreneurship teaching and modules should be introduced early in schools. Four speakers including – the Royal Monetary Authority, Deputy Governor, Yangchen Tshogyel, The Druk Journal Editor, Dasho Kinley Dorji, and two other writers spoke to students on Bhutan’s economy, issues, opportunities, and what needs to be done to spur growth in Cottage and Small Industries. Yangchen Tshogyel spoke on the Priority Sector Lending initiative and on Cottage and Small Industries (CSI). She explained the RMA’s strategies to make access to funding easier, funding being the biggest challenge right now for young Bhutanese venturing into business and entrepreneurship. “While hydropower will remain important but for a more inclusive, resilient, and diversified economy, CSI has huge untapped potential. However, for the CSIs to realise its full potential, a more integrated ecosystem is required,” said Yangchen Tshogyel. The other speakers spoke on women entrepreneurship, organic farming, and one-gewog-one-product initiative which was attended by over 420 students and some faculty members. On 15 March, a conversation was held with faculty members of the college where they shared their views on democracy and Bhutan’s economy. Faculty members pointed out the need for open discussion on politics, reflective of progressive democracy, to help them make better and informed decisions. They also called for relaxed collateral and taxation for small businesses to open up rooms for entrepreneurship. The RMA supported the conversation and seminar at the college. Similar MoUs will be signed with other colleges to help create a safe, free, and open space for conversations. To provide students, faculty members and people in the rural areas, a much needed but lacking, open, free, and safe space, Gedu College of Business Studies (GCBS) will conduct conversations on relevant The Druk Journal theme. 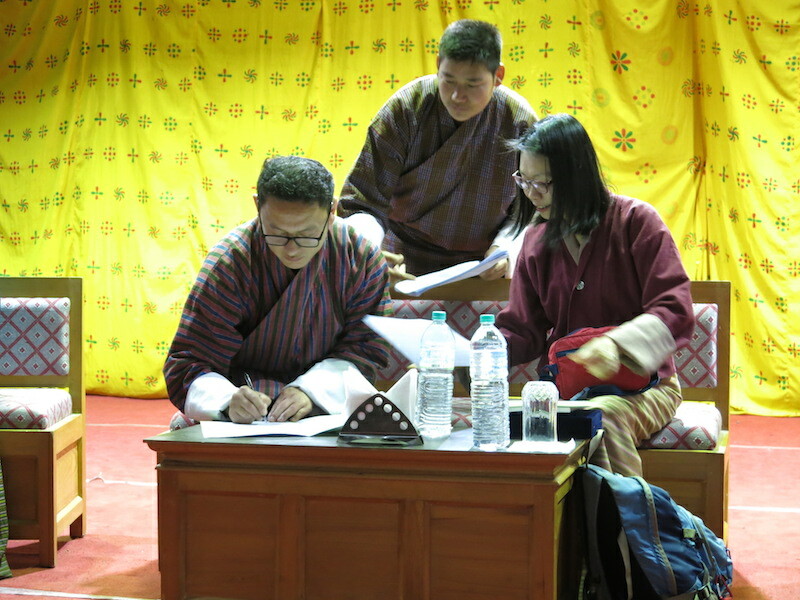 Bhutan Centre for Media and Democracy and Gedu College of Business Studies signed a Memorandum of Understanding on 16 March, whereby the latter, will conduct The Druk Journal Conversation/Seminar. BCMD will support the seminar/conversation whenever the Journal will publish issues relevant to the college. Speakers engage in conversation with the audience during the seminar at TechPark, Thimphu. 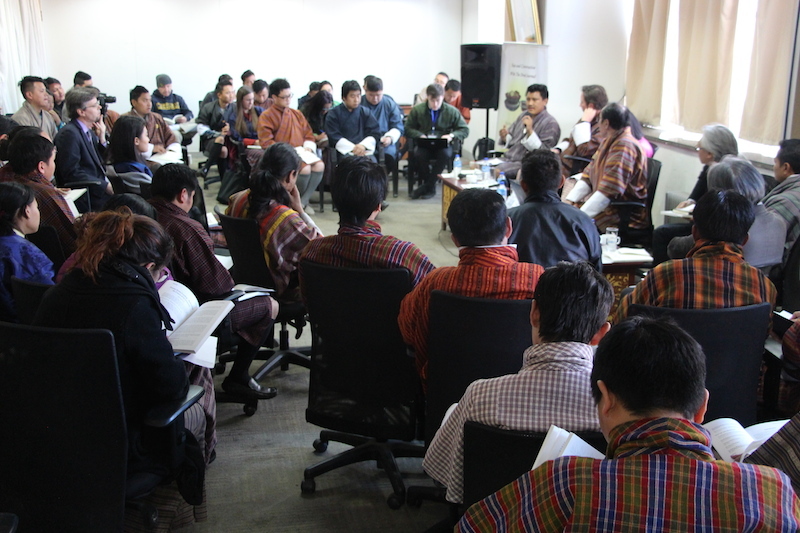 Entrepreneurs from Thimphu attending the Seminar at TechPark Thimphu on 1 March called for more space to thrash issues they face to access finance from the banks. The Druk Journal held the first Conversation on the 8th issue, ‘Transforming Bhutan’s Economy’, at TechPark Thimphu on Friday, 1 March. More than 70 people from various organisations as well as young entrepreneurs, civil servants, civil society organisation members, and officials of the Royal Monetary Authority attended the Conversation. Five contributors – Dr Joseph Lo, Adrian Bernstorff, Dr Tshering Cigay Dorji, Pema Lama, and Tshering Dorji – were a good mix of speakers who presented their ideas. Dr Joseph Lo spoke on the need to establish a creative hub for people to come together to innovate business ideas and opportunities. Pema Lama talked about women entrepreneurship and the challenges they faced as women in business ventures. Adrian Bernstorff touched on the Bhutanese agriculture and how it can be capitalised to move the economy forward. Tshering Dorji, a journalist with Kuensel, shared his views on Priority Sector Lending, challenges, and how it can be improved to finance particularly young entrepreneurs. Dr Tshering Cigay Dorji briefly spoke on how the economy can benefit from ICT in businesses. The seminar lasted little over two hours with participants sharing a number of their ideas on how financial institutions could improve access to capital. Some participants pointed out serious problems in loan repayment by small business/entrepreneurs. For example, a person taking a loan of Nu 500,000 gets a repayment term of just 3-5 years while a big business taking a loan over Nu 2 Million gets a repayment term of 20 years. A woman participant said that there is a greater need to hold such debates, seminars, and conversations with relevant stakeholders on board to enable both entrepreneurs, financial institutions, and policy-makers understand each other’s needs, issues, and way forward. The Royal Monetary Authority supported the seminar at the TechPark Thimphu. Photo Camp participant interacts with one of his subjects. The week-long Photo Camp organised in partnership with National Geographic to tell stories through the tool of photojournalism concluded with a photo exhibition at the Royal Textile Academy on 14 March. The training really was an opening for some participants as they learn better photography. “I now know that photography is not just taking pictures of anything, it is all about experiencing, touching and getting into other’s lives and creating, re-creating the story of my subject,” said one of the participants of the Nat Geo Photo Camp. The NatGeo Photo Camp team who accompanied 20 youth participants to Khuruthang, Punakha guided students to capture stories on a number of issues including, waste, positive face of modernity, happiness, a vegetable vendor, fashion, youth unemployment, migrant labourers, among others. Besides basic photography skills, the camp helped photography enthusiasts to learn to engage deeply with their subjects when shooting to simply taking a snap from a distance. The camp also encouraged students to get into an intimate conversation with their subjects, following them into their homes to really understand their stories. National Geographic supported the training.